Geraeucherter bruhwurst is a smoked German sausage, I took these along to the stadium as New Zealand played Peru in soccer. The game was the first leg of a two leg tie with the winner receiving a place in the Soccer World Cup in Russia in 2018. I spotted these in the cabinet at Park Ave Quality Meats and asked about the sausage as it was new to me. Naturally I purchased some of the geraeucherter bruhwurst for the weekend sporting fixture. Bruhwurst means the sausage can be stewed. Geraeucherter bruhwurst is a medium ground sausage made from beef and pork, it is have flavours of garlic, paprika and pepper. To accentuate the flavour the sausage is smoked. 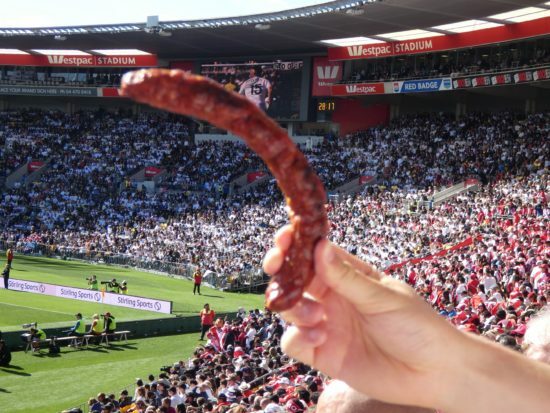 This is a very good sausage and it was well received by the group who attended the game. We had numerous Peruvian fans near us – they can teach a New Zealand soccer crowd about fanatic support. New Zealand has a FIFA ranking of 120, Peru has a ranking of 10. In the first half it was men and boys. 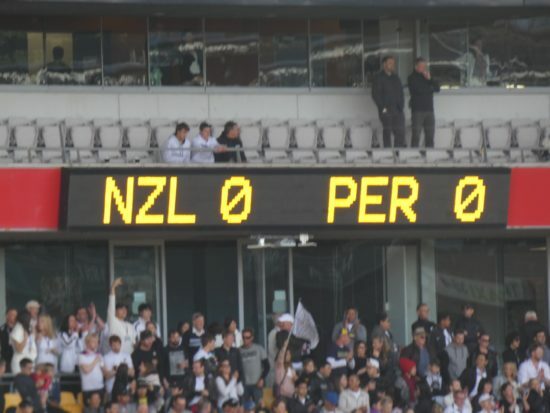 Peru were more skilful and played a deft passing game, however New Zealand hung in there. As the game progressed New Zealand gained more composure and Peru became increasingly tentative. The final score was 0-0. A good result from New Zealand’s perspective. So there was joy both on and off the pitch. The score pleased the New Zealand fans, while the sausages fed the sausage fans too. 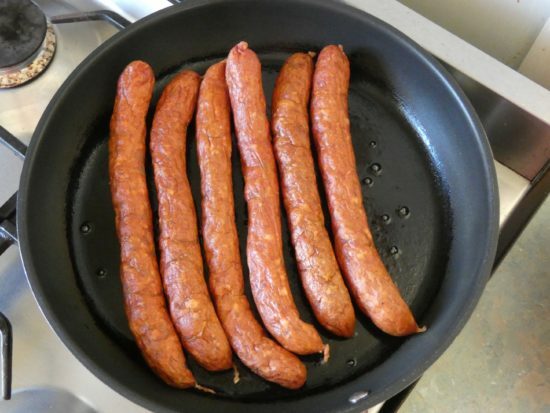 I would buy this sausage again, it is very similar in style and taste to kabonosy. As my daughter said it has not knocked kabonosy off the perch as her favourite sausage. I also prefer the kabonosy. So in four days’ time we anxiously await the return leg of the tie in Lima, Peru. I think I will have to into drop into Park Ave Quality Meats and pick up some supplies for the game. Or maybe I won’t I will be sampling the joys of hospital food. Having operation number seven on the leg on Tuesday. The medicos are talking about holding me prisoner for a week after the op. See a story about the previous playoff game against Mexico in 2013 when we received a sound thrashing.